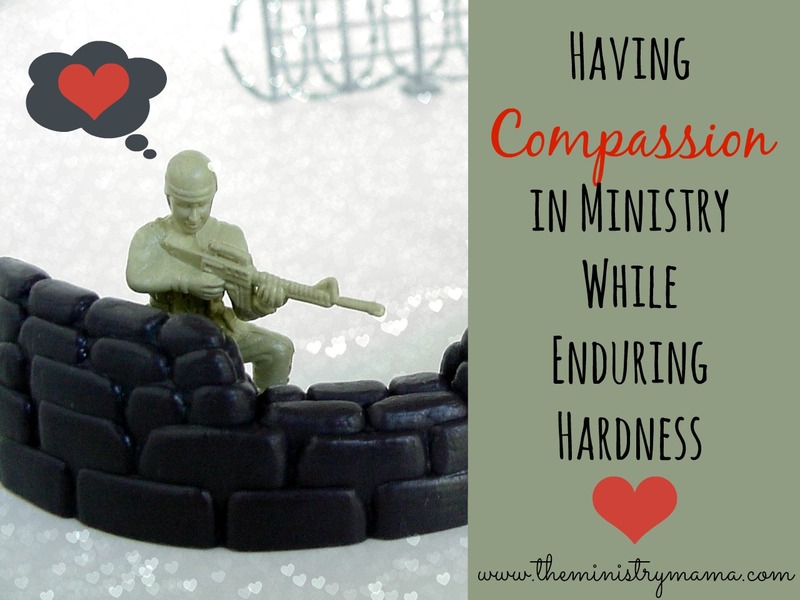 Do you have compassion in ministry while you endure hardness? Over time as problems occur while we are enduring hardness in life and ministry, our hearts and our manner can become hard. We can easily lose compassion when we get accustomed to hardness and cause a distance between ourselves and those we are called to serve. This does not happen to everyone, but I believe it is a temptation to each person in ministry. Read this verse again. We read it in our first article as we learned about Enduring Hardness in Ministry. All people react to situations differently, some will soften through the battles of life and love more deeply, and others will harden against the roller coaster of emotional and physical strain and distance themselves from the sheep… but how do you endure hardness like a good soldier and still have compassion for God’s people and for lost souls? How do we have a way about us that is contagious? There are different words used both in the Old Testament and the New Testament that define compassion according to the Strong’s Concordance, but they all have to do with having pity, showing mercy, yearning and feeling sympathy for someone. Compassion has to do with having pity, showing mercy, and yearning and feeling sympathy for someone. We are all going to go through personal difficulties and struggles with people and situations within our church. In order to obey God’s call on our life to endure like a good solider, we must stay compassionate toward people. We cannot take our frustrations out on our family or God’s sheep and please the Lord. We cannot escape to technology and neglect our Bible or relationships and please the Lord. Sometimes the grit of enduring is going to take some huge humbling of ourselves and some setting aside of our wants and disappointments so we can minister effectively with compassion. How Do You Have Compassion? Have the determination to make a difference. We must be the type of people who Jude describes in verse 22, “And some have compassion, making a difference.” Not everyone has bowels that yearn for the souls of other people or he would not have said “And some have compassion.” We do need to rise above the mundane and difficult and know that our calling is for eternal purposes even within the trenches of spiritual battle. Ask yourself whether you truly want to be a person that makes a difference. If you do, then compassion must be incorporated into your heart and life… but it must come from God. If you truly want it, then ask God for it, and then ask God what He wants you to do to show it. Have a heart and eyes likes Christ. When Jesus looked upon the multitude and had compassion on them, he saw them in their spiritual condition. He saw them as lost sheep having no shepherd. They were innocent in many cases toward the danger that was lurking in their lives and hearts. If we have a close relationship with God and are familiar with the Bible, we can begin to recognize the snares that hold them and the only hope they have in this life is Jesus Christ. Remain in contact with people’s needs. Distancing ourselves from people and their problems, even while we are trying to sort through our own, kills compassion. It can cause us to rise above them in pride or disregard them in a lack of care or immersion of selfishness. Opening our homes with heavenly hospitality. Visiting people who are hurting or struggling. Sending meaningful messages to people through text, e-mail, or through cards and letters. Saying more than “hello,” but lingering to find out how people really are. Praying with and for them during their battles. Following up and finding out how things are going at a later date. Meeting an immediate need they may have physically, emotionally, or spiritually. This includes taking meals to someone, helping them with groceries, writing out verses for them, sitting with them when they do not need to be alone. At times it may mean that you need to witness to them and tell them about salvation before meeting any other needs. We do not have to be doormats or enablers when people are going through problems. You will know when the Holy Spirit prompts your heart to make a difference. This does not mean you neglect your own personal problems that may need addressed, it means you can do both. You need people as much as they need you. I find that many times when I reach out to someone else, that it alleviates my self-pity. When I look for verses to encourage someone, that it also teaches and encourages me. There’s something about seeking first the kingdom of God and finding that your needs truly are met in every part of life. So as you go on through some hardness, I exhort you to continue to have compassion and find ways to meet the needs of other people as you look through the eyes and heart of God and minister to the sheep God has called you to. The next article in this series will be a question and answer post later this week about having compassion in ministry with insights from other people in ministry. Q&A: What Makes the Difference In Having Compassion in Ministry?